The graceful stone arched Amidabashi was built in 1690 to connect Nagasaki’s Ise-machi and Yahata-machi. It was privately financed by the Nagasaki trader Sonoyama Zenji and was 13.4 metres long and 4.5 metres wide. Interestingly, bridges in Nagasaki did not have names. Starting upstream with Amidabashi being number 1, they were actually numbered. In daily life, many people identified them using the name of the neighborhood in which they were located. Naturally, this caused some confusion, so a physician and classical Chinese scholar by the name of Nishi Dosen, gave each bridge a name. He named Amidabashi after the amida-do (a hall of a Buddhist temple revering Amida), which is located on the right of this image, and Koraibashi after its location in Shin Korai-machi (New Korea Town, later to become Ise-machi). Amidabashi was also called Gokurakubashi (Heaven Bridge). During the Edo Period, convicts walked over this bridge on their way to their execution at Nishizaka. The name “Gokuraku” came from their apparent wish for spiritual salvation. Although these days the river is only known as Nakashimagawa, it actually had many different names along its flow. Up to the confluence with Narutakigawa, it was called Ichinosegawa. From that point on to the confluence with Dokadogawa, its name changed to Ninosegawa. By the time it reached Nagasaki Harbor, the river’s name changed once again and was now called Ohgawa. The Amidabashi is often featured in photographs of Nagasaki. Partly because it was a very attractive and romantic subject for photographers, and partly because the residence and photo studio of Hikoma Ueno (1838-1904) was located nearby the bridge. Actually on the bank of the Zeniyagawa, a very short walk from where this photo was taken. Ueno plays a very important role in the history of Japanese photography. He was first taught by Dr. Pompe van Meerdervoort (1829 – 1908) at the Dutch Medical School in Nagasaki (Igaku Denshusho). The school was established in 1857 and Ueno started his studies of chemistry and photography here the following year. Around 1859 or 1860, Ueno was shown the wet-plate process by French photographer Pierre Rossier. In 1860, Lord Todo of the Tsu domain (in current Mie Prefecture) offered Ueno and his fellow student Horie Kuwajiro, who hailed from Tsu, money for the purchase of a camera. They experimented with this camera at Lord Todo’s estate in Edo (current Tokyo). Over the years, Ueno photographed many important figures of the Meiji revolution, such as Sakamoto Ryoma (1836-1867), Katsu Kaishu (1823-1899) and Takasugi Shinsaku (1839-1867). Unfortunately, this beautiful view of Amidabashi and Zeniyagawa has completely vanished. Most of Nakashima River, like many other rivers in Japan, has been fully dressed in ugly concrete. In 1982 Amidabashi itself was damaged by the Great Flood of Nagasaki and replaced with a concrete bridge. 1 Nakashimagawa is also called Nakajimagawa. 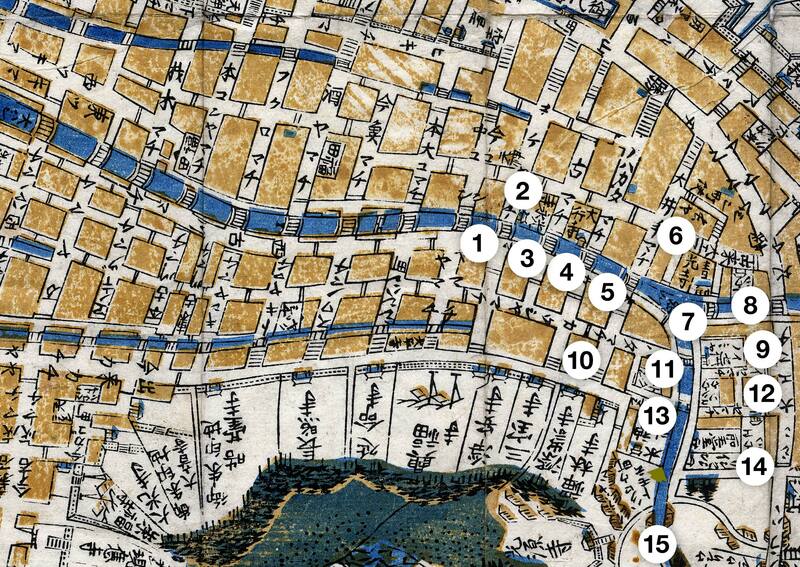 2 High-definition Image Database of Old Photographs of Japan, Old map of Nakashima River Area (1802). Retrieved on 2008-02-15. You can also licence this image online: 70523-0009 @ MeijiShowa.com. This image of Amidabashi Bridge is found in a photograph album that appears to be exclusively of work by the photographer Kimbei Kusakabe. The number 69[1?] appears in lower right corner. Fascinating. 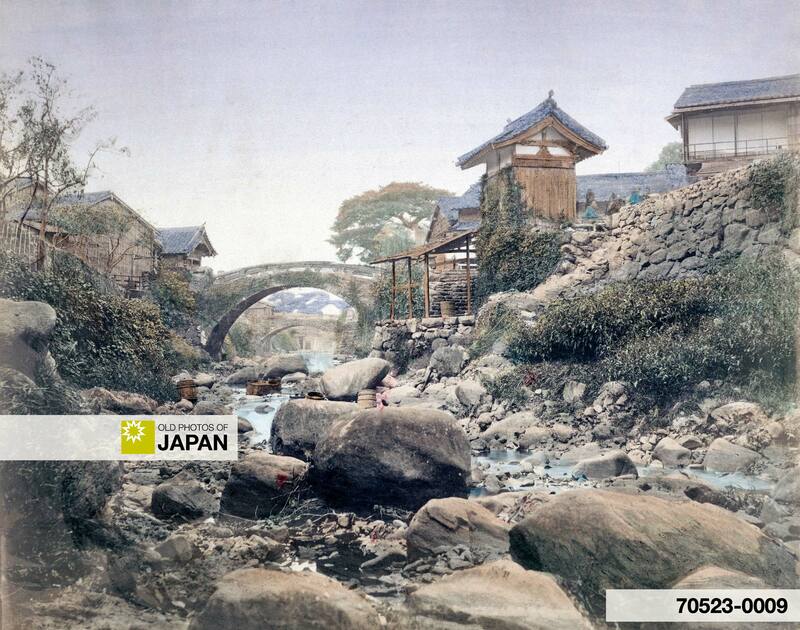 There is an image of Amidabashi Bridge in the Kimbei catalogue, but it is numbered 1421. Image 691 is the Shokonsha Temple at Kudan. Can you upload or link to a photo on which the number is clearly visible? As I have that photo in my digital archive it spiked my interest, so I did a quick image search and found a copy with the number mentioned by Paula (just above the “HIStory”). The faint and slim style of the lettering doesn’t correspond with other Kimbei’s works. I would rather say it’s similar to Stillfried ones. You have amazing eyes, Noel. Without you attracting my attention to the location of the number I very much doubt I would have discovered it. I agree with you that these handwritten numbers are not Kimbei’s style. Especially early in his career, Kimbei reproduced prints from negatives by Uchida, Beato, Stillfried and Yamamoto (Photography in Japan 1853-1912 by Terry Bennett, page 205). I have noticed that occasionally he even incorporated the image and its original image number into his own catalogue, of which we have prints from ca. 1893. It appears Kimbei may also have sold this image if Paula found it in a Kimbei album. Although the album may also have been put together by another dealer. Is there a Kimbei stamp in the album, Paula? In any case, number 691 in Kimbei’s catalogue is the Shokonsha Temple at Kudan.